There seems to be an infinite variety of bushings of all kinds of different thicknesses. Comparatively, there is a much smaller set of tube sizes, 7mm, 8mm/O, 3/8", etc... However, bushings are made per pen kit. This seems backwards to me. I'm turning between centers with the excellent TBC adapters from bsnikitas and I'm using my calipers to measure fit about 30% of the time and rely on bushings when i know they are not worn down. What I would prefer is a set of TBC bushings that simply serve to fit the tube and provide the friction needed to turn the blank, yet do not correspond to any particular kit. Does such a thing exist? I tried searching the forum, but my google-fu isn't strong enough to find something so specific. Never seen them, but how about taking some cheapie bushings (of course, not as precise as TBC bushings) of the desired tube size and just turning them down? A quick hit with a center drill will put a 60* angle on the hole so your centers will bite well. I do something similar with my seam rippers--use crappy 10mm bushings that are way small in diameter as I use calps to measure them anyway. If willing to spend a few bucks, I know there are those who will custom make TBC bushing for you. Brian Nikita is one who comes to mind, I'm sure there are many others. Get ahold of Brian and have him make you a set the way you want. Or learn to turn with a live centre and dead centre only. Skip the bushings completely. I tried that at that start and ended up ruining a few blanks by either splitting the wood, or bending the tubes such the press fit didn't work. So I'd like something that can provide the bite needed to drive on the outside of the blank rather the tiny area where tube meets live/dead center. I'm with you on this. I like to have some bushings in place, even if just for a little extra clearance between the ends of the blank and the centers. If you get some made, I'd be interested in knowing how much they are. Your idea is great and I would love to see the solution. From my perspective and experience, using cone shaped that fit a multitude of tube sizes has a strong tendency to flare the tubes. I think that hard nylon/plastic cones could work and keep it from flaring. Flaring is my problem, so I use bushings between centers until it is round and near to size. I have thought about getting me some hard plastic/nylon/etc and making a few dozen "cones" so to speak. 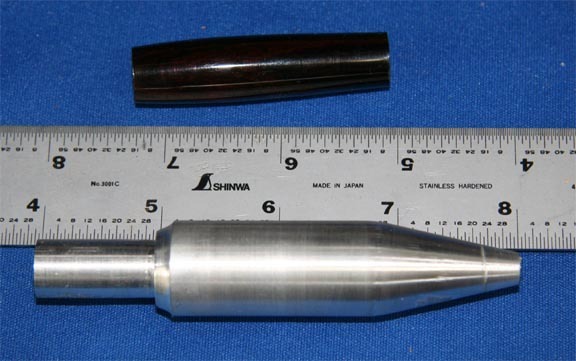 Using metal cones like that, the tubes tend to scar and dig into the cone on softer metals and flare-out on carbide tip centers. If you will notice near the tip of the cone below, you will see a scoring. That was from the tube slipping. Nothing wrong with that per se. On softer materials, each cone can be turned to fit specific tube sizes. That won't stop some slippage but will stop the flaring and give better friction than just the tip of a dead/drive center. I am not saying this is the answer, but I have long thought about what you mentioned; just haven't come up with a good answer. BTW, I don't like mandrels for several reasons, but the monotonous taking the knurled nut on and off and on and off and dropping a spacer or nut and then hunting for it - Drives me nuts. I like to keep it simple and quick. Last edited by leehljp; 01-15-2019 at 01:21 PM. Thank you. Now some research to see what a solution actually looks like. I've bent two now, in the space of a month. Though I do still use them for finishing and my mandrel savers eliminates the annoyance of the end nut. I would like to add on my interest to something like this. I know they make TBC bushings for specific kits, but I would love to just have a set of TBC bushings that would work with all 3/8" tube kits for example. I would be inclined to financially commit to a package of TBC bushings for common tube sizes. If you are sensible to a light out-of-round, why not making your own TBC bushings? I turned a set out of nylon and Teflon of all the ID I usually use. I paid a precise attention to the diameter going inside the tube (should be as tight as it can be, reaching .05mm is not that difficult, it should plop out of the tube), to the alignment of this area with the 60° cone on the opposite, and I just make the largest diameter thinner than the thinner kit I use, it means using calipers for the final blank's Od. Easy to make and so usefull! Make them from 360 brass and there is NO out-of-round. I have been doing this for years.